If you have a vinyl wall decal or another design that requires that you cut longer than the Silhouette cutting mat, you need to set it up that way in Silhouette Studio. These two important adjustments in Silhouette Studio will allow you to cut design up to 10' long with your Silhouette CAMEO or Portrait. The first thing you want to do is open Silhouette Studio. You'll notice that your work area will open, by default, with a 12x12 virtual cutting mat and work area. 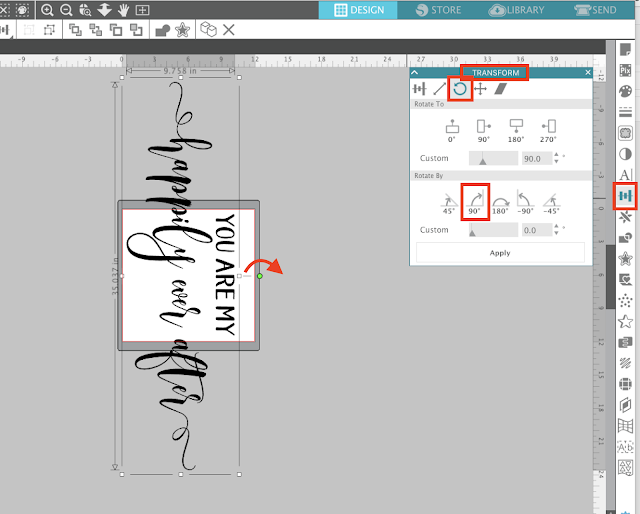 In the Page Setup panel you can see the Page Size is set to Automatic CAMEO and the cutting mat is the 12x12. 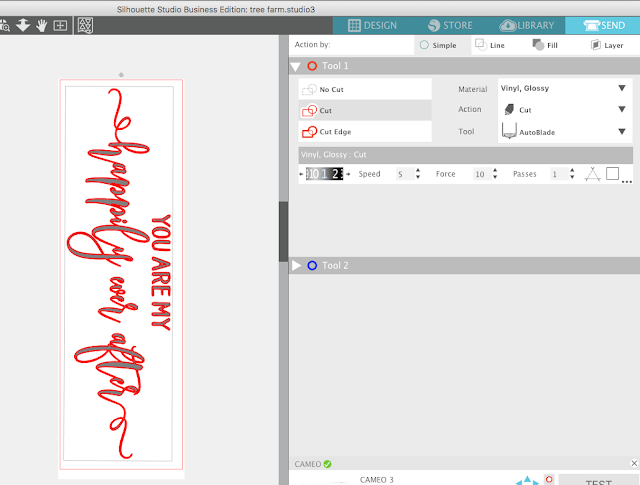 Then open up the design you want to cut in the Silhouette Studio work area. I'm working with this You Are My Happily Ever After Design which would be perfect for a master bedroom vinyl wall decal or as a wood sign design. 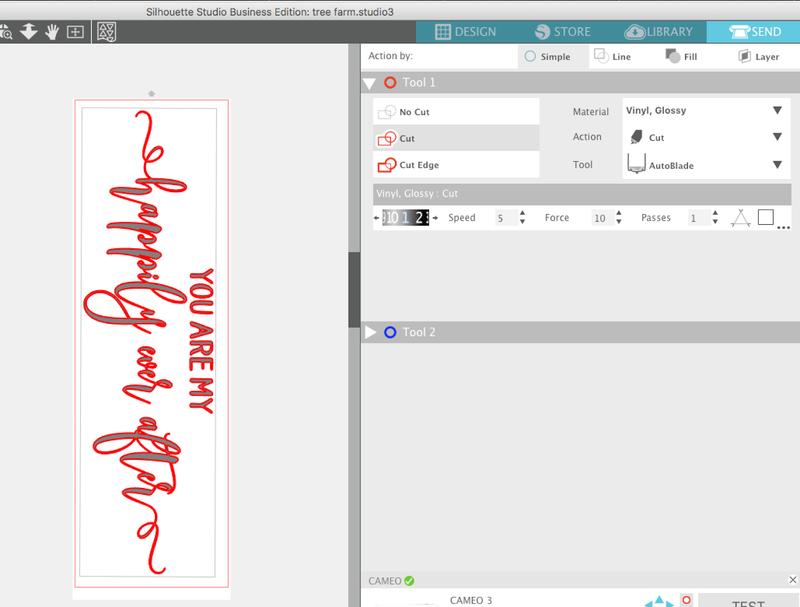 You can see that at the size I want to cut this design it's not going to fit on the cutting mat. 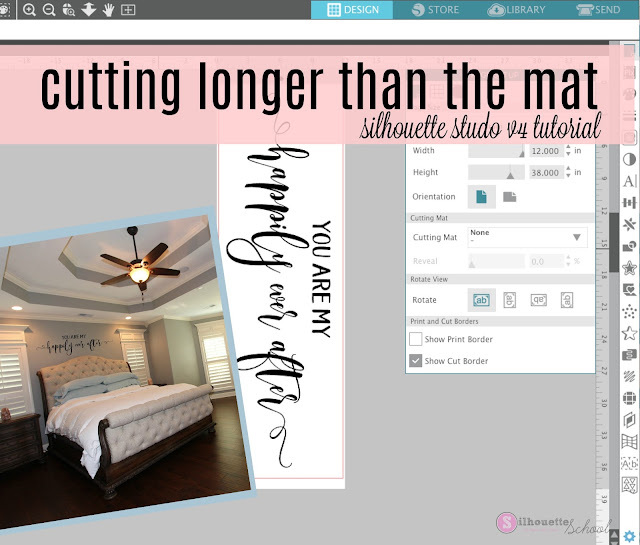 This is where you need to make some changes to your settings so you can cut longer than the mat. 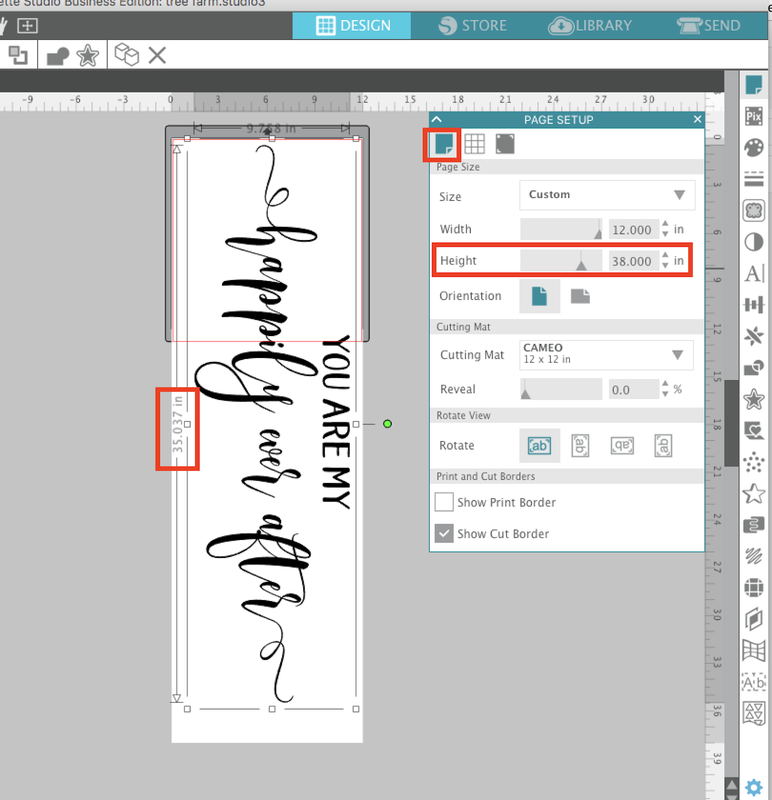 First select the design and rotate it so it's going vertically. You can rotate it by selecting the design and then grabbing the green circle at the top of the design and pulling it 90 degrees. 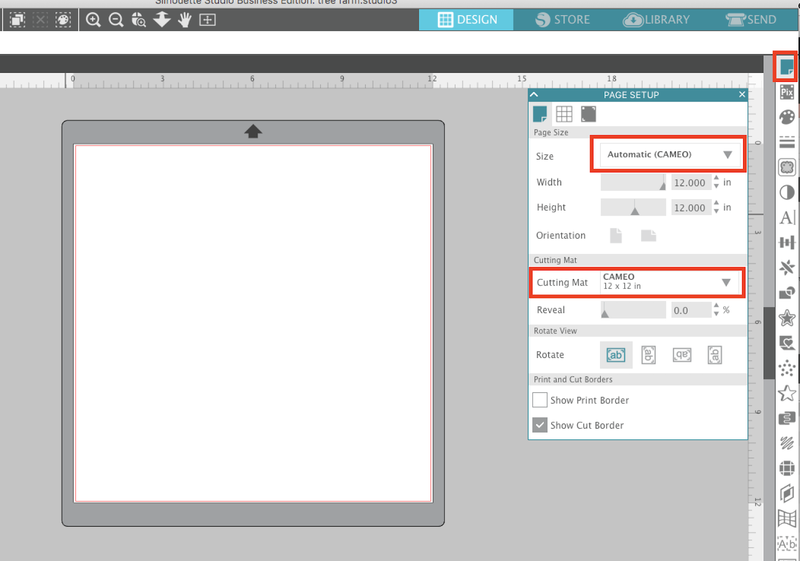 The other option is to select the design and open the Rotate tab on the Transform panel and pick "90 degrees". Return to the Page Setup Panel and at the top where it says Page Size, manually type in a value for the Height that's longer than the design's height. Think of the "Page Size" as the size of your material. So I need a piece of vinyl that's more than 35". I would recommend giving yourself a little padding which is why I'm going with 38" for the height. 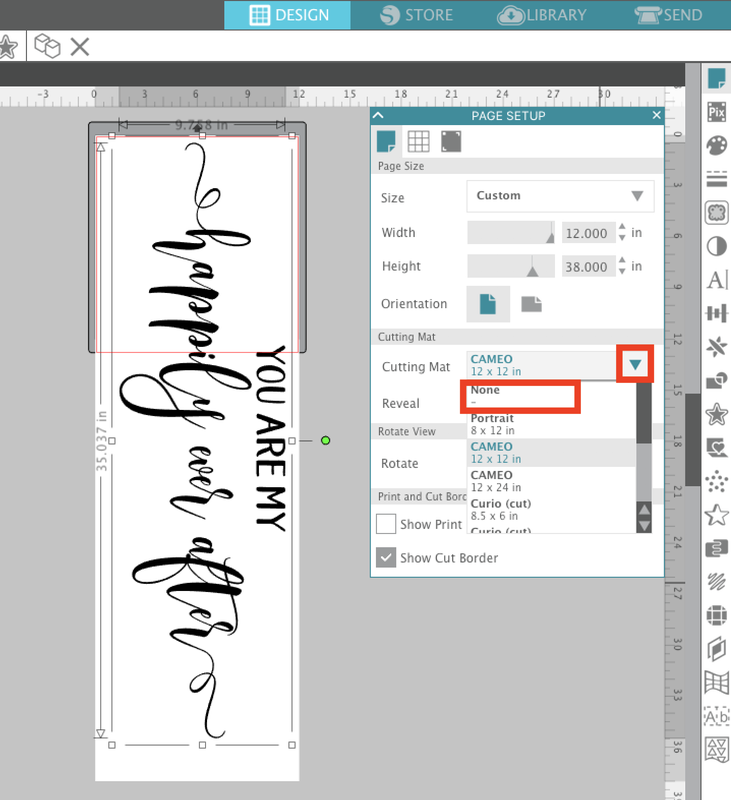 Now your large vinyl (or htv) design is ready to be cut from the Send Panel! 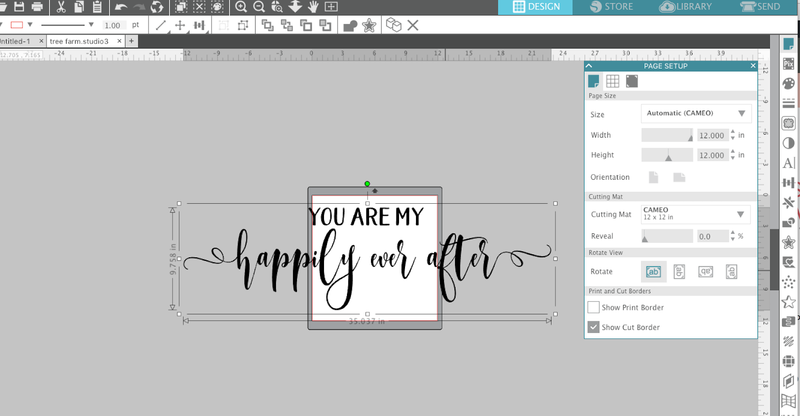 I would suggest you add weeding lines in Silhouette Studio to designs of this size to help with weeding and prevent you from wasting vinyl. 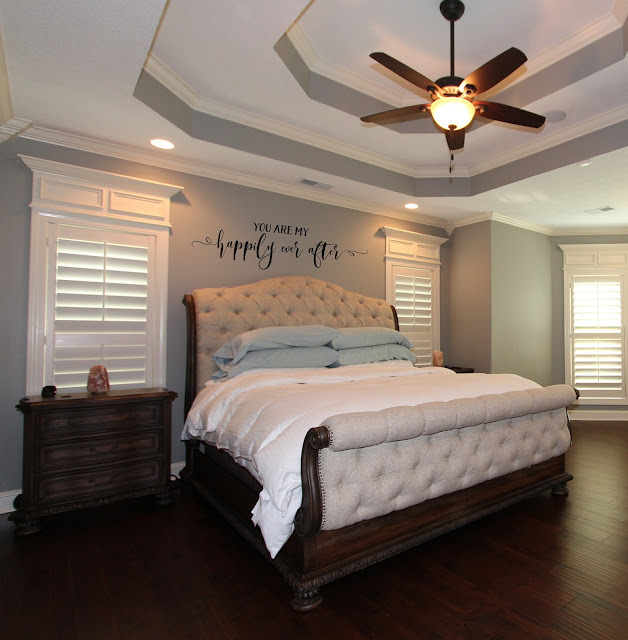 Because you are able to cut large designs all in one piece, you can easily transfer and apply wall decals as a single design using the hinge method, as opposed to piecing them together. How would the settings work for with a portrait using the feeder roll? Still 12 by whatever length? 1, SO WILL THIS WORKK ON CURIO AS WELL ? 2, DOES THE MACHINE AUTO ADVANCE TO CUT A, SAY 36" SIGN ? THANKS FOR THIS TUT. I have tried this but my vinyl always slips. What am I doing wrong? Thank you! Just to clarify--no mat is needed and the blade settings will adjust automatically (on a Cameo 3)? ?